If you are looking for help in booking the best wedding band you can for your big day then we hope the following guide will be of some help to you. Apart from being guitarist with the hugely successful Ritz Trio, Marcus Ford has many years experience both on and off stage in events management. For over ten years he was Theatre Manager at major Theatres in Scotland and has successfully managed high profile events including concerts, royal visits, corporate events and product launches. On stage he has performed at major venues, arts centres, on ships, trains and even on Concorde! 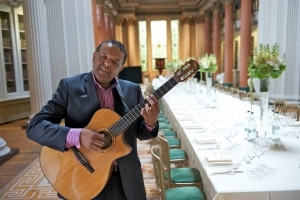 He has played at just about every major hotel in Scotland including Gleneagles, Hopetoun House, The Balmoral, Balbirnie House and One Devonshire Gardens. During 2017 he performed at over 30 weddings and numerous private parties and corporate events. This vast bank of experience has given a unique insight into event management and working with wedding parties and corporate clients and agents. So you are probably thinking about plans for your own wedding which is why I assume you are reading this article.With internet access finding information has never been easier however the overwhelming number of choices, opinions and products can make it a daunting task. A first search for “wedding music Scotland” in Google will present you with over 48,700,000 results. Ok, don’t panic most of these will not be relevant however you will see that they can be split into a few categories, Wedding Agents supplying bands, Bands own sites and general directories listing wedding suppliers.Wedding Band Agents will be able to provide you with recommendations of bands and DJs that they work with and can provide you with a one stop solution for finding all your music needs. These Agencies range from well established companies to people just dabbling in providing music. Have a read through their testimonials and speak to a few of them to get a feel of how they are to deal with. For their services and expertise you will probably pay an Agency fee of anything from 15% to 30%. Using Agencies can take away some of the risk of booking a poor band as they tend not to keep people on their books who have let them down or have a reputation for spoiling weddings! Many agents will display band testimonials next to the band they are recommending. If you decide to book a band direct then much of the above applies. Call them and speak to them. How easy are they to get hold of, do they return your calls or emails promptly? Look at the quality of the information they are providing and ask to hear sample tracks if these are not available on their website. Again up- to- date testimonials are important. You may be able to speak to your venue wedding co-ordinator and ask them what they know of the band. Look on some of the many forums dedicated to weddings and see what other brides are saying about their experiences. Ask your other suppliers i.e. florists,photographers and caterers if they know of any good (or bad) bands. Both Agents and Bands should provide you with a Booking Confirmation/Contract detailing exactly what is required from both parties.Who is the contract with? What is their address and phone number? Importantly, what is the date of your wedding? It seems strange to mention the obvious but last year the Ritz Trio turned up to an event to find that along the way the date had been changed to the following week and nobody had told the Agent. Double check your dates! The time you require the band for should also be clearly detailed on the contract including breaks.The contract should detail the fee and what this includes.Will there be any extra charges for travel and accommodation? Band/Agent’s contracts will also detail cancellation policies for both parties. You will be expected to pay a deposit to secure your booking and this amount varies. Some bands will include an overtime rate often in 30 min increments. It is best to discuss this before-hand rather starting to negotiate on the night should things need to run on. It may not be possible for a band to play after the booked time for various reasons; so again, it’s definitely worth discussing this in advance. As with most things you will be able to find cheap options however quality should be your main concern when sourcing a wedding band. Don’t be side-tracked by a cheap quote and end up booking an inexperienced, unreliable band- bad memories will prove more costly! You can read the remainder of this article on the Ritz Trio website and I do hope it will be of some help to you in booking a wedding band. The Ritz Trio are one of Scotland’s most successful, entertaining and established weddings bands – have a read at the band reviews! We would look forward to being part of your big day!